See the trends investors must understand before snapping up shares of this high-growth sports apparel specialist. This article was updated on June 5, 2017, and originally published on Jan. 19, 2017. Under Armour (NYSE:UAA) (NYSE:UA) was one of the worst performers in the S&P 500 in 2016, declining 28% as the broader market rose 10%. Thanks to that gap, and further declines in 2017, the sports apparel giant might seem like a tempting purchase to prospective shareholders. It has been, after all, one of the fastest-growing companies on the market and is staring at a massive global sales opportunity in categories like footwear, activewear, and connected fitness. Before pulling the trigger on this stock, though, here are a few key facts for investors to consider. Under Armour's sales base is approaching $5 billion per year, from just $1.5 billion in 2011. Before the recent slowdown, it had boosted revenue by 20% or better for nearly seven years and doubled its revenue base in the three fiscal years ended in 2016. 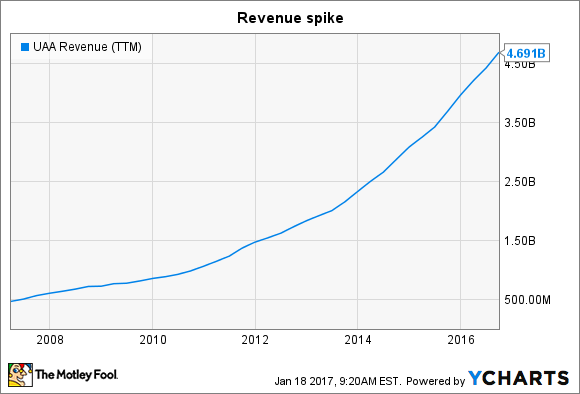 UAA Revenue (TTM) data by YCharts. That's enough to qualify the company as one of the fastest-growing stocks on the S&P 500. 2016 began with even faster gains, and the boost added credibility to management's initial 2016 forecast that predicted a 25% annual spike to $5 billion in revenue. However, Under Armour's expansion pace slowed down dramatically from there. Its second-quarter revenue improved by 28%, giving way to a 22% increase for the third quarter. As a result, CEO Kevin Plank and his executive team had to dial back their guidance, raising the possibility that the company's best growth days are behind it. The company now sees 2017 revenue rising at half last year's rate -- just 11%. Under Armour's slowdown isn't happening in a vacuum, though. Chief rival Nike (NYSE:NKE) was the Dow's worst performer in 2016 as its short-term sales and profit results also disappointed Wall Street. Most of Under Armour's recent gains have come courtesy of two big growth drivers: the push into footwear and international expansion. Revenue from outside of the U.S. is surging and now accounts for 15% of the business, compared to 9% in 2014. Nike currently gets just over half of its sales from outside geographies, which helps explain why Under Armour executives are so bullish about their long-term prospects. "We expect to be a global brand," Plank told investors in mid-2016. "The global expansion that we've been able to enjoy is something we're really excited about." The spike is even more pronounced in a footwear segment that's about to grow into a $1 billion business responsible for a quarter of Under Armour's sales -- up from 14% just two years ago. Data source: Under Armour financial filings. Chart by author. The sports shoe business doesn't enjoy the same attractive economies that apparel does, and so Under Armour has had to trade higher footwear sales for lower profits lately. Nike is also experiencing a profitability pullback, but the problem is more pronounced at Under Armour. 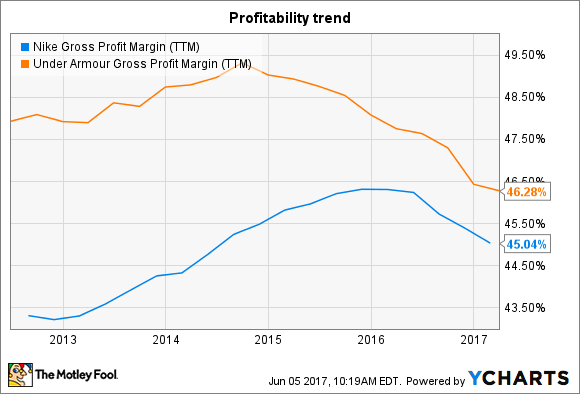 At below 46% of sales, gross margin is sitting at its lowest point since the company went public. That's risky territory for a stock that's still valued at an earnings premium to rivals and the broader market. Thanks to the online sales disruption in the key U.S. market, Under Armour is bracing for an unusually weak expansion pace ahead. Profit growth won't be nearly as strong as Plank and his team had hoped, either, as they adjust their development strategies to better protect their products from value-based and e-commerce rivals. Laying the groundwork for future growth is the right strategy, even if it means lower earnings over the next few years. If the rebound plan succeeds, though, the company will be in a much stronger profit position as an established global brand that's sprinting toward $10 billion in annual revenue.